Book Drunk: Review ~ Summertime by Vanessa Lafaye. Florida, 1935. Heron Key is a small town where the relationships are as tangled as the mangrove roots in the swamp. Everyone is preparing for the 4th of July barbecue, unaware that their world is about to change for ever. Missy, the Kincaid family's maid and nanny, feels that she has wasted her life pining for Henry, whom she has not seen since he went to fight on the battlefields of France in WWI. Now he has returned with a group of other desperate, destitute veterans on a government works project, unsure of his future, ashamed of his past. Based on real events, Summertime is a stunning debut novel, a glorious love story and a mesmerizing account of survival. It evokes vividly what happens when people in a small community are tested to the absolute limits of their endurance. Summertime is a heartbreakingly beautiful, stunning debut novel by Vanessa Lafaye. This was one of the books in 2015 I’d been most looking forward to reading but the author surpassed my already high expectations with her wonderful, powerful writing and the way she creates scene after scene of tension, so immaculately well timed in its delivery that it shapes this book into something breathtaking and very difficult to put down. 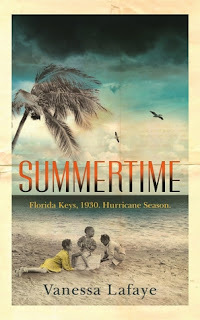 Summertime takes place in the 1930s, set in Florida Keys where the intense 1935 Labour Day hurricane is about to take place. This book is based on a very real event in history but is a fictional account, although I don’t think it could have been any more moving and effecting had it been a non-fiction book. This author’s writing is insanely good. I was struck almost straight away with the racial divide and then the segregation between the Conches and the war veterans. There was a lot of bitterness in amongst all the tension and this was another aspect that made the book very shocking and nerve-wracking to read. The sense that the storm was coming, that these people’s lives would be changed forever ensured this novel was compelling but in truth, it was the content on every single page, how each page was laced with something new, something startling that kept me desperate to read on whilst apprehensive of what I was about to discover next. There are a lot of characters with their own fascinating individual stories to tell in Summertime and it was easy to be affected by each and every one of them. At the beginning we meet Hilda Kincaid, in a less than happy marriage which is brought to our attention by Missy, who’s looking after their baby Nathan. There’s the Deputy Sheriff, Dwayne, who is faced with the shame that his wife’s indiscretion has left him the father figure of a mixed-race child that’s not even his own. The character I was drawn to the most was Henry, who was torn between the town he was a native of and the veterans he went to war with. His character realistically draws on the impact an experience in war takes on a person. Character building is yet another strength in this author’s writing and each one in their own right could have lead the novel. They are all memorable, all intriguing and all a little more than what meets the eye. One thing I particularly loved about Summertime was the atmospheric writing and the incredible descriptions which bring this book to life. Each word captures your attention a little bit more until you’re quite quickly, completely drawn in to the setting and the events which are taking place, which provides an extremely emotive reading experience given that the course of the story is so distressing. There’s such an evocative quality to Vanessa’s writing in which I could picture the area at ease, as well as almost physically feel the effects of the oppressive heat the characters were living in. Summertime is really something special and the novel will stay with me for a long time, much like the characters we meet of which none are left unaffected by the horrific events that take place. This novel is sublime and deserving of so many plaudits and for it to only be a debut novel… I’m very excited about what Vanessa Lafaye will bring us next. Great review - I so want to read this book! Thanks, Linda! It's a wonderful book.